As newly-elected Guatemalan president Jimmy Morales prepares to start his four-year term, the ghosts of the Central American country's past violence are reemerging in a dramatic way. On January 6, Guatemala's Public Prosecutor's Office arrested 18 high-ranking retired military officers for war crimes. These were some of the worst years of violence in a 36-year internal conflict that claimed 200,000 lives, the majority of them from the indigenous Mayan population. The arrests centered on two cases: the 1981 disappearance of 14-year-old Marco Antonio Molina Theissen -- a crime acknowledge by the Guatemalan State when the case came before the Inter-American Court of Human Rights -- and hundreds of extrajudicial executions uncovered at Creompaz, a site currently used for training UN peacekeepers in Cobán, Verapaz that was once known as Military Zone 21 (MZ21). Over 550 bodies have been exhumed at the MZ21, and 97 of them have been positively identified, permitting investigators to link victims reportedly forcibly disappeared between 1981 and 1988 with the military officers who were in charge of the MZ21 during those years. Never before in Latin America have so many high-ranking military officials been arrested simultaneously in connection with historic human rights cases. Those arrested were at the center of the counter-insurgency apparatus that operated in Guatemala in the late 1970s and into the late 1980s. But these arrests are not only about Guatemala's past. Some of those arrested have long been believed to be leaders of the crime syndicates that developed after the 1996 Peace Accords were signed and that retain tremendous de facto power in postwar Guatemala. Take the case of retired army general Manuel Antonio Callejas y Callejas. He was arrested in relation to Molina Theissen case, but has long been accused of ties to organized crime. In 2002, the United States revoked Callejas y Callejas' visa due to these corruption allegations. He is also believed to be at the heart of the Cofradía crime syndicate, which later evolved into La Línea ("The Line"), a corruption scheme involving the customs authority that cost Guatemala millions of dollars. Last year, investigations into La Línea led to the arrests of the sitting vice president and President Otto Pérez Molina. Some of the officers implicated are intimately connected to the National Convergence Front (FCN), the political party founded by retired military officers that brought Jimmy Morales to victory in last year's elections. Among those arrested were retired military officers who were expected to be members of Jimmy Morales' cabinet. And prosecutors have asked judicial authorities to lift the immunity of retired general Edgar Justino Ovalle, deputy-elect for the FCN and reportedly Morales' right-hand man. He is wanted in connection with the disappearances in MZ21. Over the past several years the Public Prosecutor's Office has developed capacity and initiative in prosecuting complex crimes, buoyed by the support of the UN-sponsored International Commission against Impunity in Guatemala (CICIG). This was evident with the dismantling of the La Línea crime syndicate and the resulting arrest and deposal of Pérez Molina. The recent arrests were the work of the Public Prosecutor's Office on its own, revealing how far the office has come in its capacity to investigate and prosecute complex cases. This is an important lesson for the United States and the international community as they ponder whether such a body would be useful in places like El Salvador and Honduras, where the lethal mix of inequality and corruption have fueled crime and violence, and which in recent years has led tens of thousands of Central Americans to seek safety in the United States. The intertwining of past and present in this case highlights the necessity of addressing impunity at its core in post-conflict societies, and the perils of not doing so in the immediate transition period. Countries undergoing similar transitions from war to peace, such as Colombia, would do well to take notice of the Guatemalan example. The United States should support reform efforts to strengthen rule of law in Guatemala and the rest of Central America. In particular it should listen to the voice of civil society, especially the youth, who played a critical role in the peaceful protests that led to the resignation and arrest of Pérez Molina last year. In relation to historic crimes cases, Washington should support efforts to increase the capacity and independence of the Public Prosecutor's Office and the judiciary, especially as recalcitrant sectors mobilize to discredit their work using the outdated language of the Cold War. 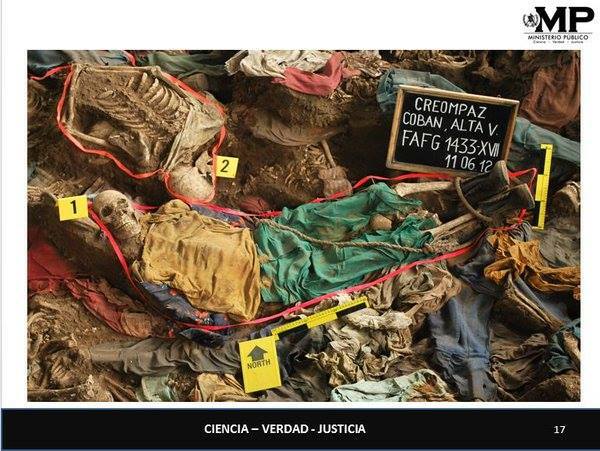 It was this external influence, as well as malicious litigation practices, that ultimately undid the genocide verdict against former dictator Efrain Rios Montt. The United States could also help investigators by declassifying all documents pertaining to the Central American civil conflicts. Washington should also come clean on its own role in perpetuating the murderous regimes that reigned in Central America during the height of the Cold War. Finally, as the United States gears up to implement its new Strategy for Engagement in Central America, it should ensure that funds are used to strengthen mechanisms of transparency and accountability, and improve the lives of ordinary citizens, especially young people. In places like Guatemala, lasting peace and prosperity depend on combating poverty as well as impunity. Educator, writer and human rights activist. Teaches at George Mason University; Senior Fellow at Washington Office on Latin America.